Many of India’s states are in action mode to improve their profile and create a conducive policy environment for investments. Some have, of course, failed to move with the changing times. The fifth of an 11-part series looks at the state of affairs in Jharkhand. Living under the shadow of Naxalite violence in a pocket of Jharkhand’s Dumka district, Sumi Hembrom, 27, had never thought she’d one day become an entrepreneur. Kathikund, where she lives, 350 km from the state capital here, had been under the influence of Naxals till recently. This is where the Left insurgents had killed a police superintendent, Amarjit Balihar, and four of his subordinates in 2013. The violence, however, has not dampened the confidence of Sumi, a high school graduate. A year before, she took up a project under a start-up programme. With 10 other women, a seed capital of Rs 5 lakh was organised to set up a unit to weave saris, the Panjhi sari (popular among Santhals), in particular. Sumi makes Rs 10,000 to Rs 15,000 a month, satisfactory for her and two dependents. “We don’t want to remember the past and want to look forward instead,” she says. The goal is to come up with products good enough to compete in the market. Sumi is as an example of how the state, formed after bifurcating Bihar, has started trudging along the road to development. Numbers tell a story. Growth in gross state domestic product (GSDP) was 3.71 per cent in 2002 and is now 8.83 per cent, according to the state’s economic survey for 2015-16. The prime contributor is the services sector, its share in GSDP at constant prices rising from 33 per cent in 2004-05 to about 49 per cent in 2015-16. Also, for the first time in the history of the 16-year-old state, a stable government is in place, led by Raghubar Das. “Political instability was one of the reasons that had stymied the pace of development,” admitted the state’s first Chief Minister Babulal Marandi. The state accounts for approximately 40 per cent of the total volume of minerals produced in the country. However, a report from the Associated Chambers of Commerce and Industry of India says there has been a worrying drop in the industrial share of GSDP over the past decade. The economic survey also says the manufacturing sector is yet to gain momentum. 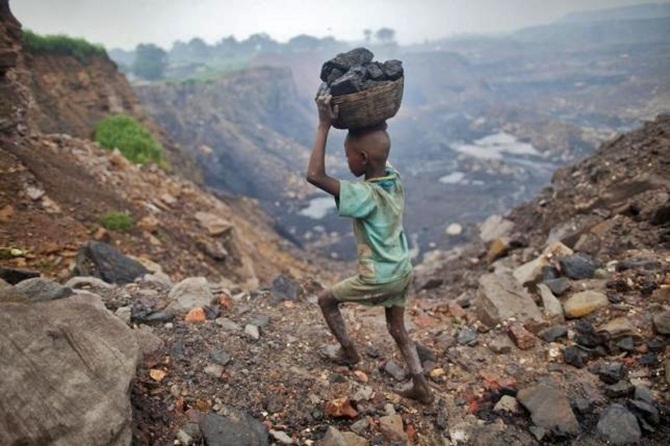 “Land and rehabilitation are the two major issues that have affected industrial growth in the mineral-rich state,” says Ramesh Sharan, head of the economics department at Ranchi University. The government has lacked vision and it reflects in the policies, he said, with policy designed without the participation of local industrialists. Now, however, there seems a change in momentum. “The state is now reaching out aggressively to investors and getting a very positive response,” says industry secretary Sunil Kumar Barnwal. The big leap forward would be the land bank the government is developing to facilitate allocation to industrial units. “People have given away land for construction of schools, hospital and development work,” said social activist Dayamani Barla, who led a protest that forced ArcelorMittal to change the location of its project. There would, however, be no protest and people would come out in support if the government assured every displaced person a job, Barla added. Some major projects seem to be making headway. Within two months, Adani would start work on a proposed 1,600-megawatt (Mw) power unit; it has started the process of procuring land. JSW Steel has environmental clearance for a 10-million tonne per annum steel unit and a 900 Mw captive power plant, at a cost of Rs 35,000 crore. Land would have to be procured. Sharan thinks it would be prudent on the state’s part to focus on medium, small and micro enterprises (MSME), as a big source of employment and growth. The small units could be ancillary to the big industries, he added. Existing MSMEs are, however, mostly on the verge of closure, claimed Anandeshwar, president of Laghu Udyog Bharati. To which Barnwal says the government’s trying to maximise procurement orders from the segment. There is some effort to make things more business-friendly. And, some infrastructure development has taken place, especially in roads. In the next three years, 16,538 km of roads has been planned. One reason to focus on industry is that the growth rate in agriculture is in single digits, 7.9 per cent for the past year. The total area under irrigation is only about seven per cent. Of the three states that were carved in November 2000, Jharkhand was the only one that had battled, with some violence, for separating over decades. The legacy continues. While the Naxalite violence is somewhat less, there is unrest elsewhere. Villagers from Iril Ashram, Labed, Kute, Nayasarai, Mudma and Aani on the outskirts of Ranchi city have resorted to an indefinite agitation to protest the planned ‘Greater Ranchi’ to come up on 3,000 acres. Before Jharkhand woos investors, it needs to do more to set its house in order.